The 7 Modern Wonders of the World are as follows: Itaipu Dam, The Golden Gate Bridge, The Empire State Building, CN Tower, Panama Canal, Channel “Chunnel” Tunnel, and the Netherlands North Sea Protection Works, however, I feel there is now an 8th, the release of Bob Dylan and The Band’s Complete Basement Tapes, finally in their entirety! I have been a die hard Dylan fan for years, and the legends and myths surrounding the legendary basement sessions is well known among Dylan fans worldwide. Although Dylan and The Band (his backing band during his initial going “electric” and the primary musicians on the Highway 61 and Blonde on Blonde albums were known as “The Hawks”) released a snippet of these recordings in 1975 as an actual album, the 24-songs released were a mere “crumb” of the actual 130+ songs recorded between 1967 and 1968, now available in the 6-cd set just released this past November. I’ve only delved into 3 of the 6-disc set and so far it’s been very impressive; you hear a mature Dylan jamming with a group of musicians, often free form, making up lyrics on the fly, and sometimes just re-working some of his own songs, and those of others, such as Johnny Cash (Big River and Folsom Prison Blues) in a relaxed atmosphere of artistic freedom and exploration. Absent are the artistic pressures of multiple takes in order to “get it right”, instead the mood is melancholy and silly at times, as heard in “See You Later Allen Ginsberg”. The majority of the recordings were made in the basement of Big Pink, a house in West Saugerties, NY that was rented by members of the band, thus the recordings allow the listener a raw and unadulterated room full of musicians doing what they love. The music allows you, even briefly, into the world of Dylan’s writing and creative spirit, and also the talents of his peers who roll with the every changing tempo and mood that Dylan wanted at a moments notice. Although it may sound outlandish to say, I really love every track on what I have heard thus far; it would not be an exaggeration to say so. The Basement Tapes are a fun collection of music that allows the listener just another glimpse into the mystery of Dylan as an artist. There has always been a shroud of mystery with Dylan; it is well known that he is a recluse, often avoiding the limelight and media a majority of his career; although it is gems like this whereas one feels that Bob is toying with his fans; giving them just one more taste of what they crave, more mystery, more unheard of tracks lying around in a moldy box awaiting to be discovered 40 years later. And that is what the Bootleg Series has been about, about: Dylan not allowing the fan to truly know who he is, not willing to open up entirely, but yet giving hints here and there and keeping the fans enthralled. Dylan is not quoted in any of the liner notes, and from what I believe, has not provided any interviews regarding the release of the official bootleg series; so on one hand he is exposing the essence of his inspiration and creative genius, and on the other hand hiding behind the curtain that he always has. 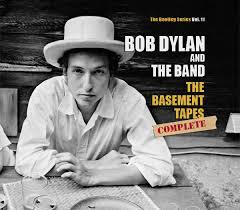 The release of The Basement Tapes Complete is the 11th volume of the Bootleg Series that Columbia Records has made available thus far; so who knows how much more is out there? I recall many years ago while visiting a long forgotten record shop in Saratoga Springs, NY, right down from Café Lena (a folk mecca where a young Dylan spent a great deal of time), I came across “Great White Wonder”, a well known and well sought out bootleg album that circulated for years; this album contained a few of the songs found on the Basement Tapes, an other rarities, many bootlegs have surfaced since then as well. Each bootleg, of which there are many, contained odds and ends of other songs from the Saugerties basement sessions, so the myth for so long has been that there clearly were more, but where, and who had them? Often waived off by members of The Band and perhaps Dylan himself, that additional tracks existed, clearly they did. It is my understanding that last year someone was able to obtain the collection of the remaining basement tapes (100+ songs) and put out a bootleg for the masses; upon learning about this Columbia Records (in partnership with both Dylan and remaining members of The Band) decided it was true and that the majority of unreleased tracks had been made available decided to make an official release (with even more tracks!) available finally. My question is why had they waited so long, and perhaps worse, allow time for someone to release the additional tracks? These guys had 40+ years to get this stuff out there! The fun things about this box set is that all is revealed “warts and all” of what actually happened in that basement in West Saugerties; with most bootleg recordings one would normally expect grainy poor quality but these recordings have a haunting quality of clarity. If you are a Dylan fan this is a must listen without question. If not, and are then curious about Dylan, although an exhaustive collection for the first-time Dylan listener, this is a great introduction to the dynamic range of style Dylan was capable of, and introduces one to the persona of Dylan himself. I’ve never been one to be obsessed about live concerts about my favorite musicians; often I have made the point not to buy anything live since it seems like a marketing ploy or filler album for the artist; buying them time since to release anything of substance at a later date. Recently, and in my old age, I’ve come to appreciate the art of the live concert and what gems they can provide with enlightening the listener with new perpectives and opinions about the artist. Last month I posted my new discovery of the live music repository Nugs.net and the incredible vast assortment of live material recorded free to the masses; better yet is that the recordings were made directly off the soundboards, so the quality is near perfect! This might be where my disdain for live shows may have root; the quality. Back in high school the only live recordings you could get of shows were either the ones the artist released or some bootleg recording made with a hand held tape recorder (yes, I’m that old!). I recall one trip to NYC in the West Village there was actaully a store (I think on MacDougall) that sold bootleg concert tapes; I think I picked up some random Rush and Van Halen shows and dreaded my purchase all the way home; that was the first and last time I invested in live material. Yes, there have been the random quality live releases such as Rush’s first live album, 1976’s “All The Worlds A Stage” and Peter Frampton “Frampton Comes Alive” (but to be honest “Do You Feel Like I Do” and “Show Me The Way” are the only two songs that anyone really remembers, the remainder of the album is not very impressive). But really I cannot recall any live shows that really were worth the investment long term. Of course, my new found interest in Phish has changed much of my opinion; Phish’s “A Live One” and “Hampton Comes Alive” are great examples of incredible live material, but then with technology changing and also Phish taking true “pride in ownership” about their sound, they have redefined why live shows have merit and provide lasting listening pleasure. The catalog of live Phish that LivePhish.net offers is astounding; and 99.9% is recorded directly off the boards; each show is a quality listening experience. Although there are many incredible shows available on Nugs.net (I believe a sister site of LivePhish.net), the one I have been listening to non-stop has been the Dave Matthews and Friends show at the FleetCenter in Boston 2003. Of course having lived in Boston for over a decade, the old Boston Garden has taken on too many names due to greedy corporate sponsorship, I think today it is called the “TD Banknorth Boston Garden North Station Thingy” or something like that, ugh. The show is a culmination of various artists joining Dave on stage as he released his first solo album entitled Some Devil. The biggest hit off of this album was “Grave Digger”, but during the concert he plays a plethora of both old and new material; some new solo work and classics from his well known band. 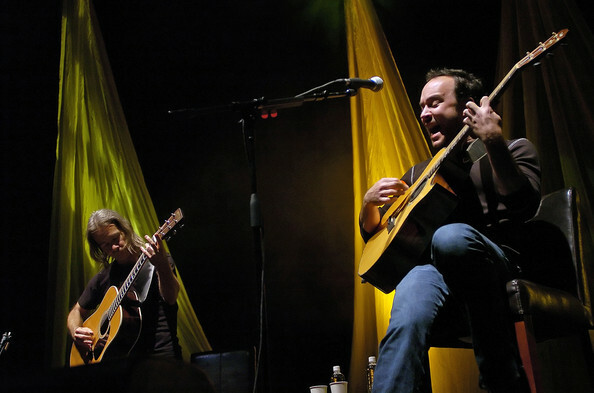 One of the highlights are the songs he plays with longtime friend Tim Reynolds; songs like “Dancing Nancies” and “Typical Situation” are just so well done that you find yourself listening to them over and over. Matthews is accompanied by the legendary Emmy Lou Harris on songs like “Save Me” and “Oh Sister and the meloncoly sounds of both artists create a tempo that compliments both artists styles. Trey from Phish accompanies Matthews on classics such as The Bands “Down on Cripple Creek” and Billy Preston’s classic “Will It Go Round In Circles”. It is a gem of a show and the sound quality is second to none. You can download the show for free on Nugs.net (look at the top right of the home page “Free Stash” and scroll down to Dave Matthews and Friends) it is a two-set download and well worth your time, trust me. We here at HiFi Central are curious on what you think about this show and about Nugs.net; have you found a show that is your favorite?